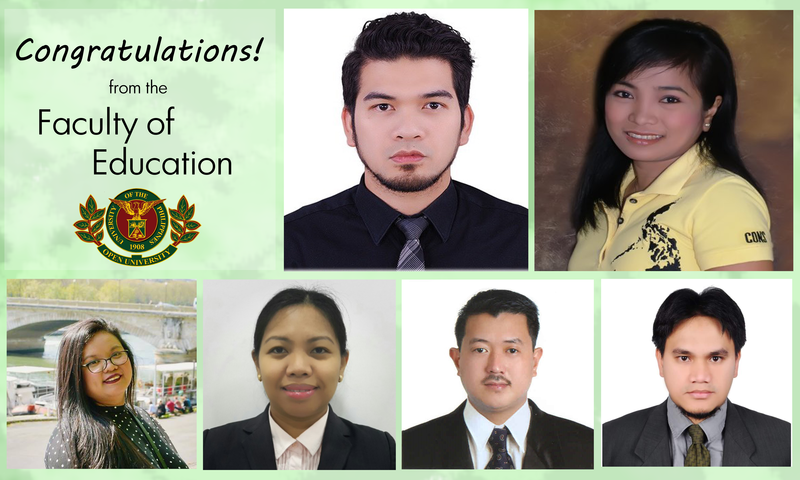 Six completers of the Professional Teaching Certification (PTC) program offered by the Faculty of Education (FEd), University of the Philippines Open University (UPOU) successfully passed the August 2018 Special Professional Licensure Examination for Teachers — Secondary. Four of them emerged as topnotchers. In the official results released by the Professional Regulatory Commission (PRC), 56 secondary teachers out of 277 examinees successfully passed the examination. Jerwin Capuyan topped the licensure examinations with a rating of 84.8%. Also included in the list of Top 10 passers were Ma. Consuelo Navarro, who ranked third, and Kristin Theresa Perez and Genevieve Piencenaves, who placed fifth. Edgar Name and Mohammad Nur Jikiri Inggilan also passed the exam. Experiences as a UPOU PTC student varied among the six exam passers. Ms. Navarro realized that being a distance e-learner was difficult because time and effort were vital in finishing course requirements. She found doing her projects and research challenging because her professors were strict in checking for plagiarism on their students’ works. Meanwhile, Ms. Perez understood that having self-discipline and determination to complete the program were essential in her being a UPOU PTC student. She recognized that her UPOU professors were mere facilitators of her learning. As a student, she held the responsibility of keeping pace with the course schedule through submitting outputs by deadlines, getting rid of distractions, and setting priorities straight. On the other hand, the difference in time zone became one of the challenging factors as a UPOU PTC student for Ms. Piencenaves. However, using the MyPortal helped her communicate with group mates despite the spatial and temporal boundaries she experienced. Mr. Capuyan shared that being a UPOU PTC student helped him reach three of his goals as a teacher. First, it further strengthened his qualifications as a teacher. Second, he became confident because being a UPOU PTC student allowed Mr. Capuyan to also learn about the pedagogies related to teaching, which he now considers equally important along with the mastery of the subject matter. Last, it opened opportunities for him to be a public school teacher in the Philippines. Mr. Name’s aspiration of becoming a teacher motivated him to persevere in his studies and now that he had passed the examination, he shared that he has plans to go back to the Philippines to pursue his teaching career and inspire his future students. Similarly, for Mr. Inggilan, becoming a UPOU PTC graduate provided the option for him to teach if he returns to the Philippines after working at the Kingdom of Saudi Arabia. All newly-licensed teachers advised students and students-to-be to never lose determination and focus on achieving their dreams and goals, so that they will also be able to finish their studies. One of them emphasized that opportunities to learn are everywhere. A person only has to take advantage of the option, such as becoming a distance e-learner at the UPOU, and make the most out of the experience. As mentioned through an ABS CBN article featuring the exam results, the licensure examinations were administered by the Board of Professional Teachers in Abu Dhabi, United Arab Emirates; Al-Khobar, Jeddah and Riyadh, Kingdom of Saudi Arabia; Bahrain; Oman; Qatar; Kuwait and Singapore. The PTC program is a non-degree program designed for individuals who have completed a Bachelor’s degree in any field and who intend to teach at the secondary education level. Those who have completed the 18-unit professional education requirement are allowed to take the Licensure Examination for Teachers (LET) which is administered by the Professional Regulatory Commission (PRC). For more information on the PTC program, as well as other programs offered by FEd, you may visit the FEd microsite.